The Barbados Defence Force culminated its 39th Anniversary week of activities with a Parade and Sunset Ceremony. The Parade, under the command of Major Carlos Lovell displayed exemplary skills in drill and musicianship, in the presence of the Honourable Dale Marshall QC, MP Attorney General and Minister of Legal Affairs, representative of the Prime Minister, under the theme A United Force: One Vision, One Journey, to build the best Barbados we can together. In his featured address, Minister Marshall reminded the audience and thanked the command, enlisted ranks and civilian staff of the Barbados Defence Force, for being a beacon of excellence to the Barbadian landscape and beyond. He added that the Force is responsible for the molding of Barbadian men and women in areas of discipline, teamwork, time management and problem solving, which are some of the key contributors to a dynamic post independent Barbados. The immaculate 39th Anniversary Parade turnout and drill precision displayed by the troops was pleasing to the Attorney General and Minister of Legal Affairs as he further endorsed the launch of the Force’s new digital camouflage pattern, commenting that it further added to the professionalism of the Force. He urged the troops to wear it pride and to continue in a united effort to make a better Barbados, Region and beyond. 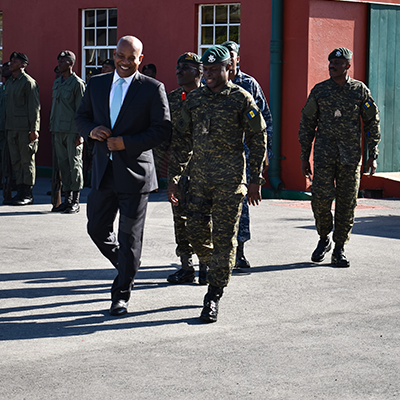 Attorney General and Minister of Legal Affairs the Honourable Dale Marshall QC MP with Parade commander Major Carlos Lovell after inspecting the troops. Unveiling of Leonard Banfield house by Mrs Pauline Banfield, the Honourable Dale Marshall QC MP and Chief of Staff Colonel Glyne Grannum. 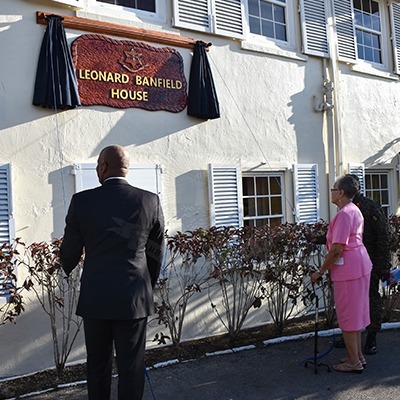 During the Parade, the Force Headquarters building was named Leonard Banfield House, after the late Colonel Leonard C Banfield, GCM, LVO, MBE, ED, JP; by his widow Mrs Pauline Banfield, the Honourable Dale Marshall and Chief of Staff Colonel Glyne Grannum. Colonel Banfield joined the Barbados Battalion of the South Caribbean Force in 1941 after leaving the Cadet Corps at Combermere School, and was granted a commission as a Second Lieutenant in 1942. Colonel Banfield was responsible for planning and coordinating the military ceremony on the night Barbados became Independent on 30 November 1966 and was awarded the Most Excellent Order of the British Empire (MBE) for his outstanding contribution. He was the Commanding Officer of the Barbados Regiment in the early 1970’s. On the occasion of the 75th anniversary of the formation of the Barbados Volunteer Force, he was promoted to the rank of Colonel, and became the first Chief of Staff of the Barbados Defence Force (BDF) on 15 August 1979. Col Banfield coined the BDF motto “Symbol of Excellence”.